Our trip to Scotland is now over (we’re still in the UK for another 10 days though). As we spent most of our time in the Speyside and in the highlands and Orkney, my reviews this month have all been of whiskies from distilleries in those regions. 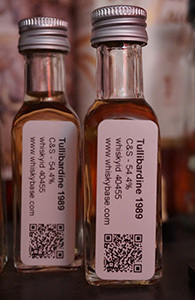 This is true as well of this review, of an older Tullibardine. The distillery is located in Perthshire—just a little north-east of Sterling, in the relative vicinity of Deanston and Glenturret. I did not visit it. I did, however, purchase this whisky from Cadenhead’s in Edinburgh on this trip (as I did Friday’s Glen Ord); and so this is also my third review in a row of a whisky purchased and consumed on this trip (the Skara Brae Orkney malt was the first).